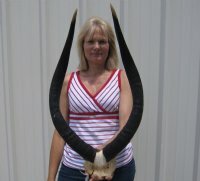 African nyala skulls with horns, hand picked and photographed are perfect for African themed decorating, hunting lodge decor and rustic cabin decor. All of our African nyala skulls with horns are from wild African nyala and all will have natural imperfections caused by the animal fighting and living in the wild. All our nyala skulls are by-products of the African Government's culling program and farming industry. All products were professional cleaned and/or professionally tanned in South Africa and cleared by the U. S. Fish and Wildlife Services and U.S. Customs Services for legal entry into the United States. Boxes valued at $250 and over require a signature.